This radiator has 2 Inch Inlet and Outlet Tubes. Fits A and AV after serial number 41330, B and BN after serial number 40193, (Super A, Super AV, Super AV-I, all to serial number 355669) all without water pump. Has 2 inch inlet and outlet tubes. Core size is 17 3/8 inches wide X 16 1/2 inches high. Does not come with a cap. Uses Radiator Cap part number 43983D. New, aftermarket Radiator for sale with a solid manufacturer warranty. 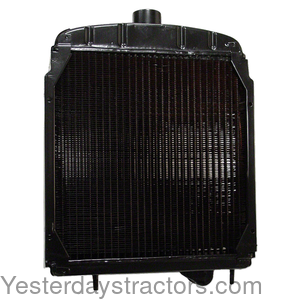 In addition, we have a generous 30-day return policy if this Farmall Radiator for Farmall A, AV, B, BN, Super A, Super AV, Super AV1 tractors needs to be returned for any reason. Please see our Parts Warranty and Return Policy links on your left for complete details before returning.